Villa Yaz is in an ideal location being only 10 minutes walk from the centre of Dalyan and yet in a quiet location. All bedrooms have en-suite shower rooms with an extra shower room downstairs. Notes on accommodation: For the comfort of all our guests Villa Yaz is stricktly a non smoking house. If any items are broken or damaged we do ask guests to replace them. The shops in Dalyan will sell items that are provided in Villa Yaz. Warning - Henna tatoos may be very tempting to younger guests however they will mark bedding, towels and furnishings. Also some people have had an allergic reaction to henna resulting is skin blisters and in one case scaring. 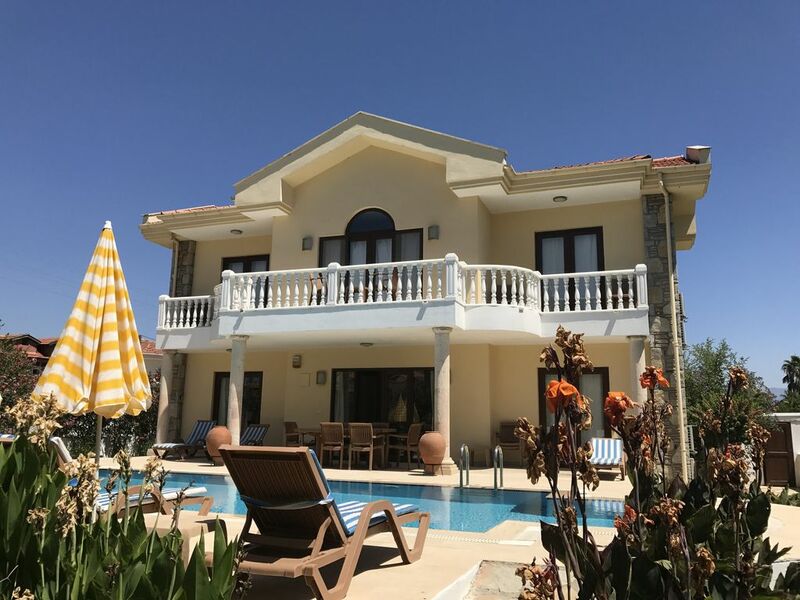 Outside: Villa Yaz has a private garden which includes a pool, BBQ, shower, and Turkish seating area (Kosk). Utility Room: The washing machine is located in the utility area under the stairs. Cleaning / Towels / Linen / Maid service: Villa Yaz is cleaned in preparation for your stay with extra cleaning for holidays of more than one week. Bedding and indoor towels are provided but we do ask guests to provide their own outdoor and beach towels. Cot bedding however is not provided. Villa Yaz is a 15 minute Dolmus ride to the beach. The Dolmus stops at the end of the road, a two minute walk. Alternatively the river taxis will take you to the beach through the river delta, a 25 minute ride past the ancient rock tombs and through the reed beds where you will see numerous birds such as Kingfishers and Egrets, or even an Eagle if you are lucky. Iztuzu beach or Turtle beach is renowned as a nesting site of the Loggerhead Turtle and as such the beach is closed at night. The nearest international airport is Dalaman which is a 25 minute transfer time from Villa Yaz. Flights depart from most UK airports including Exeter, Bournemouth, Gatwick, Stanstead, Newcastle, Manchester, Edinburgh to name just a few. A hire car is not really needed when holidays in villa Yaz as Dalyan has plenty of activities to suit most needs. Regular mini buses (dolmus) can take you further afield at very reasonable rates, or just hire a car for the odd day to travel into the mountains. Ancient city of Caunos 20 minute walk. Take the rowing boat across the river for a truely memorable trip. Iztuzu beach 15 minute bus ride or 25 minute water taxi ride. Booking Notes: Changeover Day: We do not stipulate a change over day. Bookings are taken on a first come first served basis. We do endevour to allow guests to remain at villa Yaz until their departure, however in busier periods this may not be possible.